William Owen O'Neill of Rough Rider fame was born in either St. Louis Missouri or Washington D. C. on February 2nd 1860. Over his life time he had become a miner, newspaper editor, politician, sheriff, and a captain in the army. 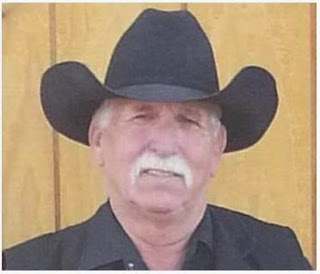 He earned the nickname "Buckey" because he enjoyed bucking the odds at the game of faro. 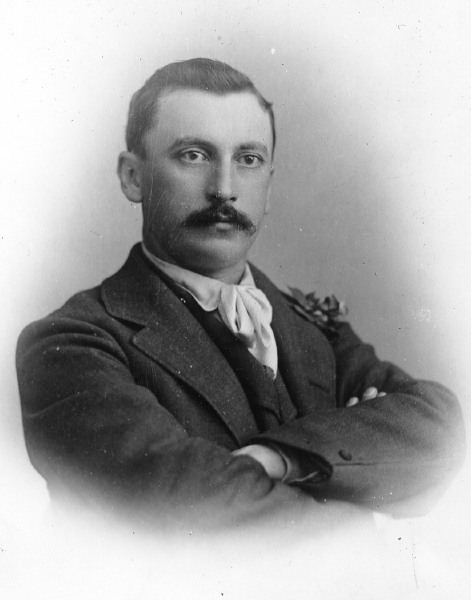 Little is known of his early days, but in 1879 Buckey O'Neill made his way to Tombstone in the Arizona Territory where he joined the Tombstone Epitaph as a reporter. During this time period in Buckey's life, he had a casual relationship with the Earp brothers. And when the gunfight at the O.K. Corral had taken place, it is highly likely that he would have been one of the on scene reporters after the fray. Buckey left Tombstone in 1882 heading for Prescott with a short stay in Phoenix. By the time O'Neill landed in Prescott to put down roots. he was 30 he had served as court reporter, probate judge, superintendent of schools, tax assessor and newspaper editor and publisher. 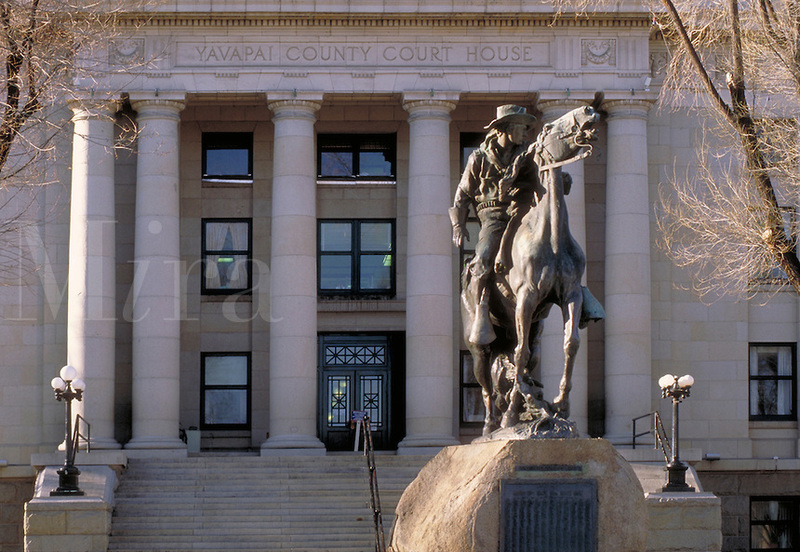 While in Prescott he took a job as editor of the Prescott Journal Miner newspaper, then a court reporter, and afterward started his own paper called the Hoof and Horn which was directed toward the livestock industry. After starting his own newspaper, Buckey joined a local unit of the Arizona Militia called the Prescott Grays in 1886 where he held the rank of Captain. Also in 1886, on April 27th, he got married to Pauline Schindler. They had a son who was born premature, but he passed away shortly after his birth. Buckey also served as the Yavapi County, Arizona, Judge in 1888, and during this time he was elected to the position of County Sheriff. 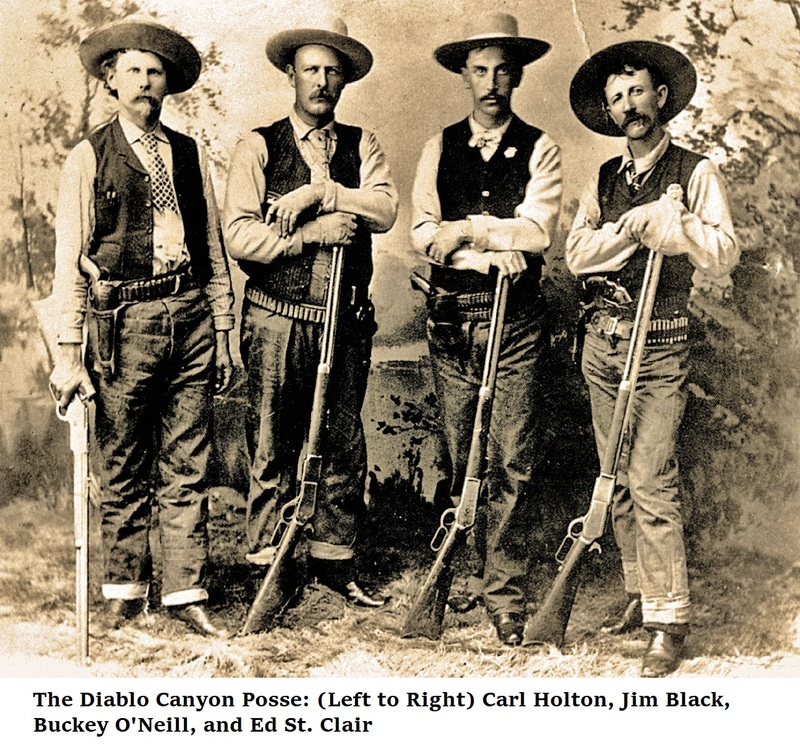 During his position as sheriff, Buckey led a four man posse in pursuit of four other men who had robbed the Atlantic and Pacific Railroad passenger train in Diablo Canyon on March 20th 1889. He and his posse caught up with the desperadoes on the following day, March 21st, where a short shootout had ensued with Buckey's horse being the only one killed. The four robbers surrendered and were sentenced to eight years in the Yuma territorial prison. Once Buckey's term of sheriff had ended, he was then elected as the mayor of Prescott. One odd side note, during this time period Tom Horn was one of his best friends. In 1879, Buckey O'Neill began speculating on mining prospects and sold a group of claims near the Grand Canyon to some Chicago brokers which proposed the building of the railroad from Williams, Arizona, to the South Rim for the mines. This rail service still runs today for tourism to the canyon. O'Neill then began to work at doing railroad surveys, mining development, and he also built a smelter. In 1898, Buckey joined the Rough Riders when the war broke out between the United States and Spain. He became the Captain of Troop A. The Rough Rider regiment was made up of cowboys, miners, gamblers, athletes, Native Americans, and other adventurers. They trained for several weeks in San Antonio and then shipped out to Tampa, the departure point for Cuba. On June 22nd 1898, the Rough Riders landed at Daiquiri, Cuba, where two buffalo soldiers fell overboard and Buckey jumped in the water trying to save them wearing his full uniform as well as his saber. After a few minutes of searching for the men, he had to give up. They fought a battle at Las Guasimas shortly after landing, suffering a handful of casualties. Some might not realize that despite their name, the Rough Riders fought on foot. 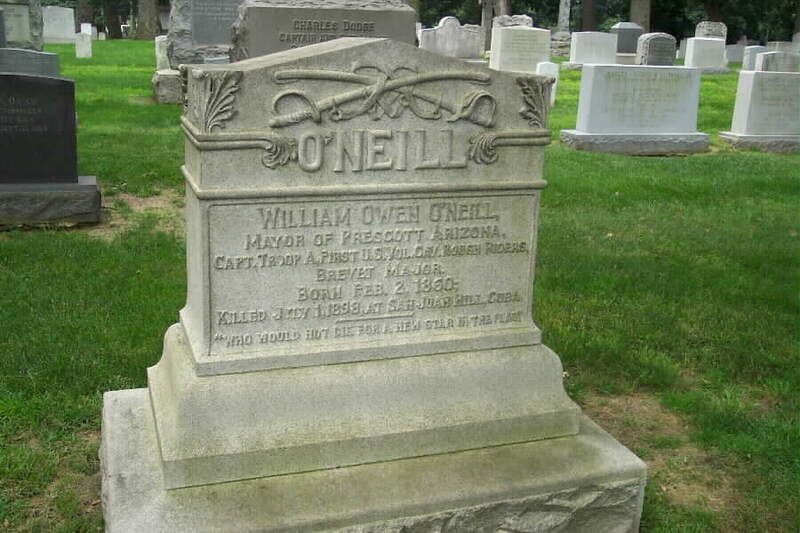 William Owen "Buckey" O'Neill was killed on July 7th, 1898, around 10 a.m. while at the bottom of Kettle Hill. Although his men pleaded with him to lie down, Buckey walked back and fourth down the line of his men under heavy fire. He felt that an officer should do this for the effect on his men. While doing so, a bullet struck him in the mouth and crashed through the back of his skull killing him instantly. He was 38. Once the battle had come to a close Captain O'Neill's men buried him on the slope of San Juan Hill. But after the war had ended, friends and family, with the help of the State Department, recovered his body and he was reentered in Arlington National Cemetery in section 1, site 294. Buckey O'Neill, Arlington National Cemetery in section 1, site 294. In Prescott, Arizona, there is a monument of Buckey O'Neill built by Solon Borglum. It is located at Courthouse Plaza there. On July 3, 1907, the monument was dedicated to O'Neill and the other Rough Riders. During his time at the Grand Canyon Buckey built a cabin in 1890 right near the edge of the canyon on the South Rim. This cabin is a one story structure set upon a stone foundation and is now one of the guest accommodations of the Bright Angel lodge. It is listed on the National Register Of Historic Places.